One of the challenges called for using something clear... another one called for rainbow colors or wings and the rest evolved. The buttons are made with polymer clay, the butterfly with paper flowers. Anyway, if you want to see more details and descriptions, just click on card image and enjoy. I'm using a Quietfire Design rubber stamp quote. Such a supercute card. Thank you so much for joining in on our theme this week, over at Truly Scrumptious. How very pretty and how very true!! I really like how you did the stripes! Great card! Thank you for playing along with my flutter by challenge! Wow! So many wonderful techniques you've used, and a truly beautiful card. 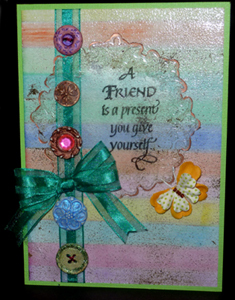 I am so pleased you came to join in at THE CRAFTY PAD this week in our 'Use Something Clear' challenge! Wow, Thanks so much for joining in on my Buttons and Bows Challenge over at Wags'n Whiskers this time! This is a fabulous project, love the image! You're invited to join in on my blogversary candy till 8-30 :) Good luck! Really creative card - love the way you made the stripes and the collection of buttons looks fab. Thanks for joining our 'bling' challenge at Totally Papercrafts this week. HI there - great make - I love those buttons! Thanks for joining us at Wags 'n' Whiskars - we have another challenge starting today 'Sparkly' - hope you can join us!